Like a number of cars in our top 50, the Audi A3 benefits from a timeless design, giving it perennial appeal at used car dealerships. Those four rings help too, because despite being a Golf in a posh frock, the A3’s interior is an undeniably cosy place to spend time. The second-generation TT has a much sharper, more masculine appearance, and its interior continues to set the standard in the sports car class. Its digital instruments are crisp and cool, while displays mounted in the centre of the air vents are a touch that marry function with flair. 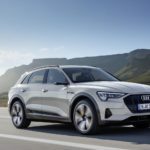 Audi has been showing its new all-electric e-tron in Milton Keynes, one of four key locations chosen by the UK Government to spearhead vehicle emissions reduction initiatives as part of its Go Ultra Low Cities programme. 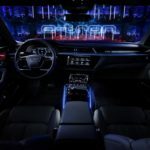 Audi is launching its electrification offensive with the world premiere of the e-tron. 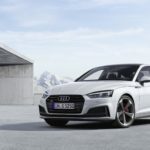 By 2025 Audi will offer twelve models with all-electric drive in the most important markets worldwide and expects to achieve roughly one-third of its sales with electrified models. 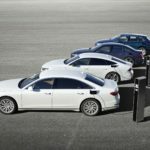 The SUVs in this portfolio include the e-tron and the e-tron Sportback, which is due to make its debut in 2019. A series of models with classic body layouts such as Avant and Sportback will also be available. The range will cover every relevant market segment from the compact to the full-size class. A major waypoint on the journey towards electrification of the Audi model range has just been reached: Audi Brussels has this week begun volume production of the Audi e-tron. 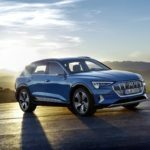 The company says its first all-electric SUV has a range suitable for everyday use, and thanks to its charging capacity of up to 150 kW can be primed and ready for a long distance journey in around 30 minutes using a quick-charging station. Audi will present the final production-ready car for the first time at its world premiere in San Francisco on September 17.